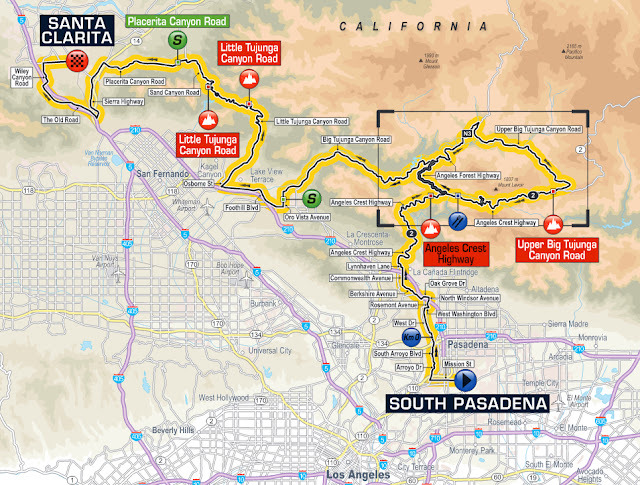 Yesterday over 400 cyclists joined professional cyclist Laurens ten Dam on a virtual ride on Zwift in Long Beach California area (virtually) to kick off the announcement of the ATOC. For a resident of Colorado - a snow-locked winter state - the technology of Zwift was fascinating to watch. Somehow Laurens ten Dam, the well-known charismatic Dutch rider, now on the Giant Alpecin team, made riding on an indoor trainer seem competitive and fun. 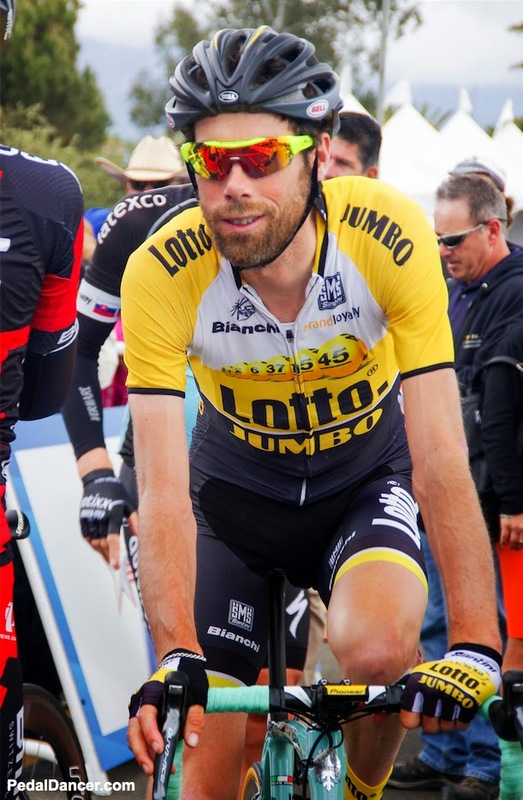 Always one of my favorite riders in the peloton, ten Dam recently moved to Santa Cruz, California with his family. Years ago I remember hearing how much this experienced European pro rider enjoyed the United States and dreamed of one day living in this country. I was happy to hear he made the relocation a reality. It is exciting to hear a visitor to this country expound on great local rides, bike shops, coffee shops, food (Mexican, BBQ & food trucks! 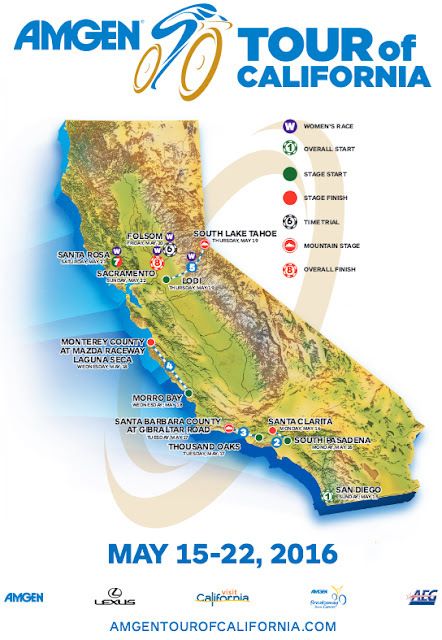 ), atmosphere and events discovered throughout California (Laurens ten Dam also plans to race the Leadville 100 mountain bike race in Colorado this year after his road season). In a year when I am not always proud of the American face portrayed in the media - Laurens ten Dam reminded me to appreciate those little things of cycling. 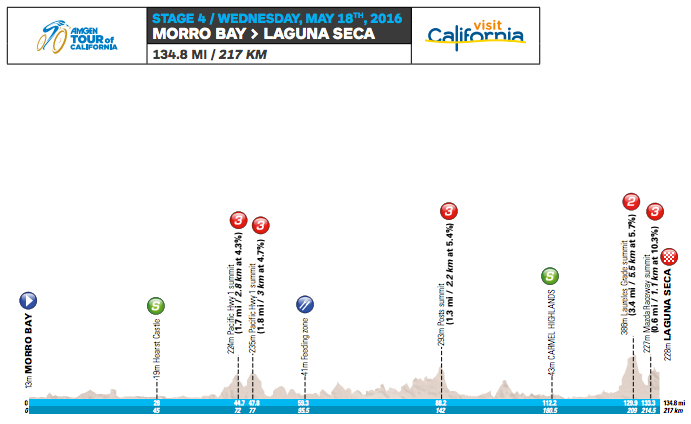 The 2016 individual stages of the Amgen Tour of California are a perfect representation of the best of California. 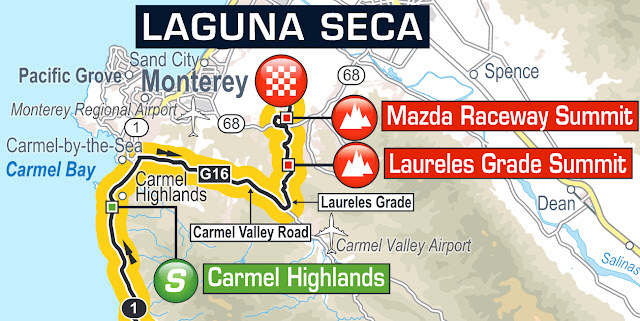 Not only will the 11th annual stage race attract the top pro racers, the routes designed this year are very challenging. Each day will rewrite possibilities of who will be wearing yellow. I expect some surprises in this year's race. Bradley Wiggins will again ride the Tour of California in 2016. Le Etape California 2016 route covers Stage 3 from Thousand Oaks to Santa Barbara (mountain top finish up Gibralter Rd to La Cumbre Peak, return to town). Race Organizers announced on March 1st that Peter Sagan, current World Champion Road, will return for the 2016 Amgen Tour of California. 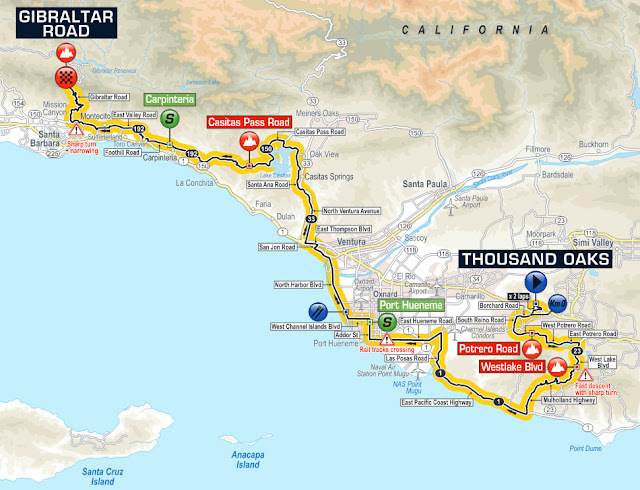 Read more from Pedal Dancer® on the TOUR OF CALIFORNIA GUIDE PAGE for spectators. 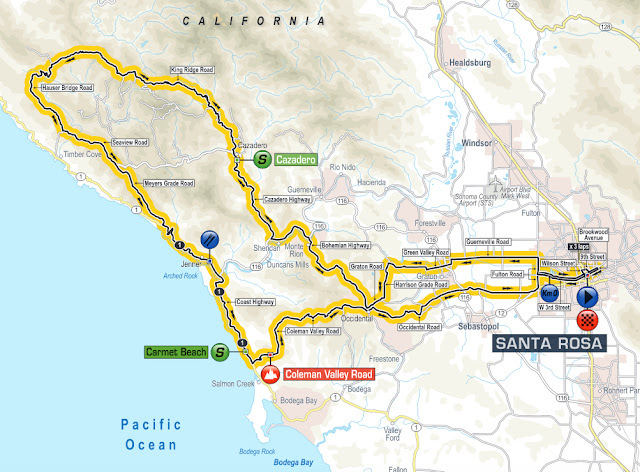 Announcement: all of the Amgen Tour of California Pedal Dancer Guide Page information may now be viewed on a brand new website created for pro cycling fans at: Tour Chaser (TourChaser.com). 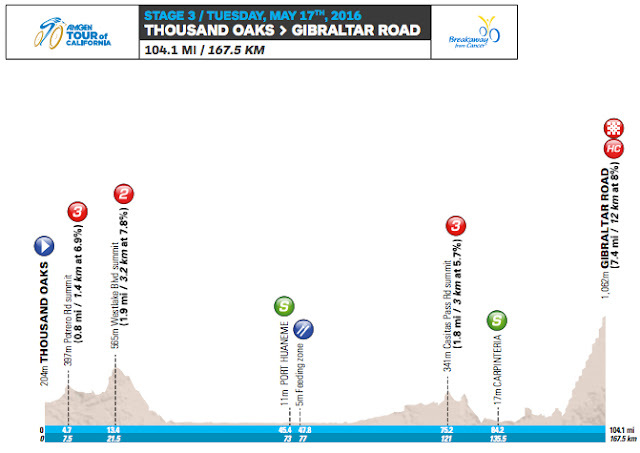 The stage date, stage start times, finish times, distances and elevation gained are listed for each stage. NEW WEBSITE: All of this information may also be viewed on a brand new website created for pro cycling fans at: Tour Chaser (TourChaser.com). CALIFORNIA TOURISM: Visit California offers tips on where to see the race and local businesses of cycling significance, here: Visit California Tour of California page. WOMENS RACE: You may see details for the women's race at Tour of California on the Tour Chaser page Women's Race TOC - with teams, list of riders, favorites, stages, route maps, printable startlist, and a startlist of the women's teams for the Team Time Trial in Folsom. Stage 1 - San Diego, May 15, 2016 Stage 1's start and finish on the water near Mission Bay and downtown San Diego. The start and finish are not in the same exact location. 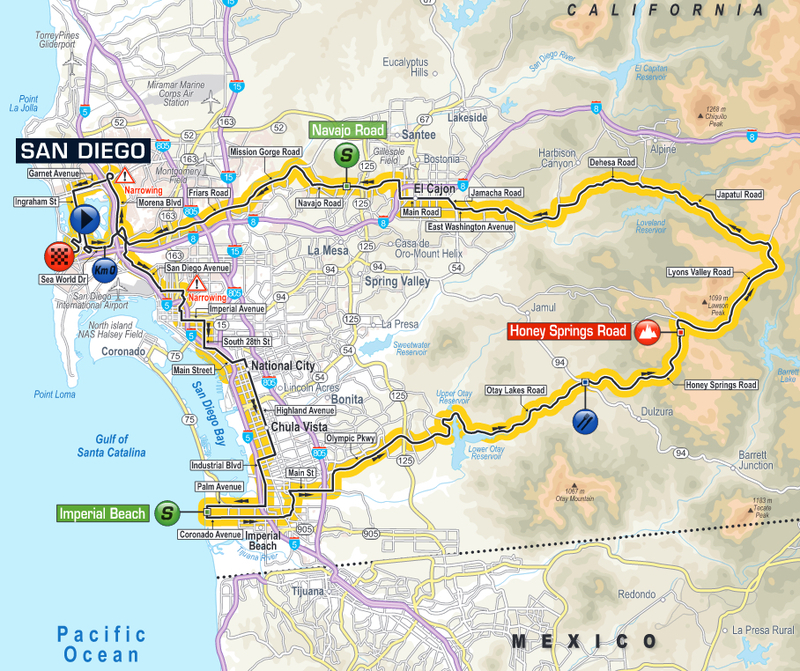 Stage Start time: Mission Bay San Diego is 11:30 AM (the San Diego Local Organizing Committee has wrongly printed the start time as 10:30am, this is incorrect). As at every other UCI race, riders must sign-in on the sign-in stage, at least one hour prior to the stage start. There is also a customary singing of the national anthem before the start; these proceedings are not considered the race start (affecting road closures). 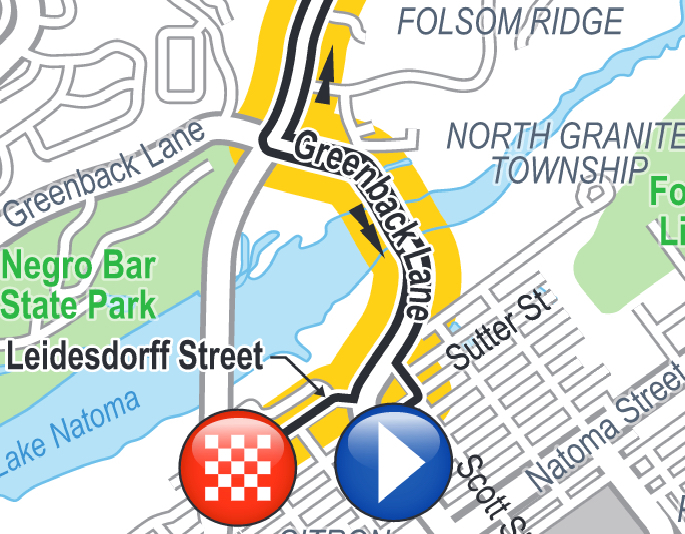 Start and Finish line are not in the same location. 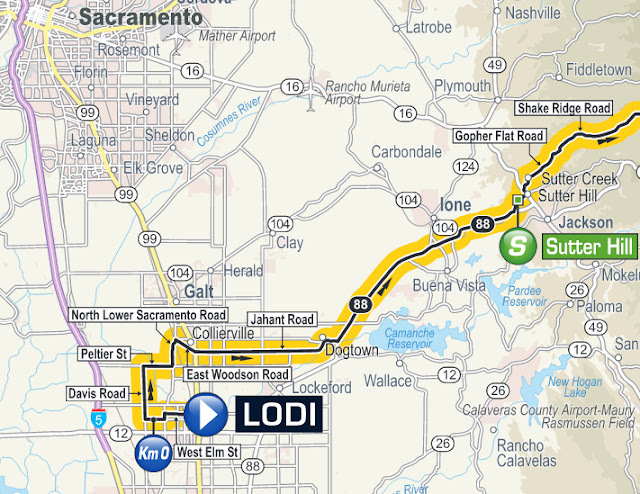 Watch Parties on route: 9 different watch parties are planned along the route of Stage 1, find a party. Festival Hours near start / finish: 10:00 AM - 4:30 PM. Festival location: on Quivira Way, Pacific Beach. 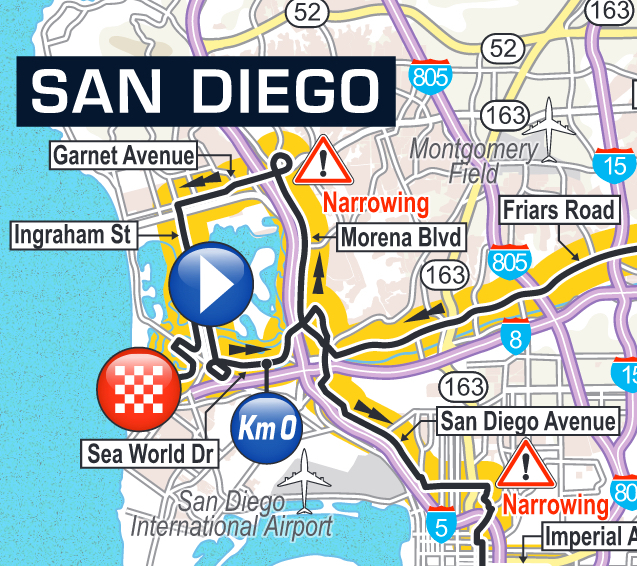 Breakaway Mile: Register for the San Diego Breakaway Mile (prior to the men's race finish). 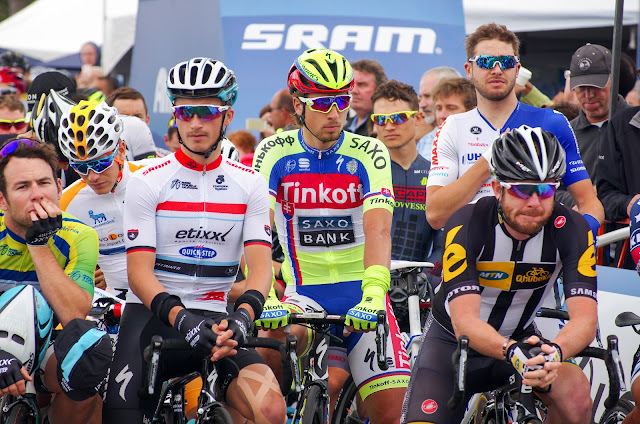 Valet bike parking: Blind Stokers Club will be providing secure Bike Valet for cyclists riding bikes to Stage 1 start and finish venues on Mission Bay. Stage 2 - South Pasadena to Santa Clarita, May 16, 2016 Stage 2 will begin in first-time Host City South Pasadena, with much of the race contested in the Angeles National Forest. King of the Mountain (KOM) points in the Angeles National Forest including Highway 2, Big Tujunga and Little Tujunga Canyon. 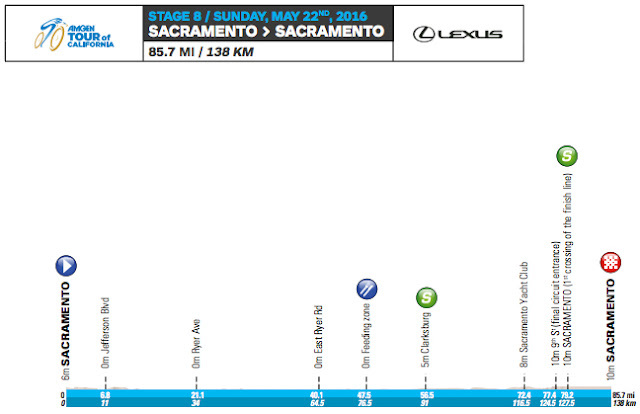 Stage 2 will be a sprinter's finish. Expected Outcome: Group sprint finish, wide, flat finish in downtown Newhall. Stage 3 - Thousand Oaks to Santa Barbara County, May 17, 2016 Thousand Oaks is home to biotechnology company Amgen, the race's title sponsor since its inception. The day will conclude with a thrilling, first-time mountaintop finish at Gibraltar Road. 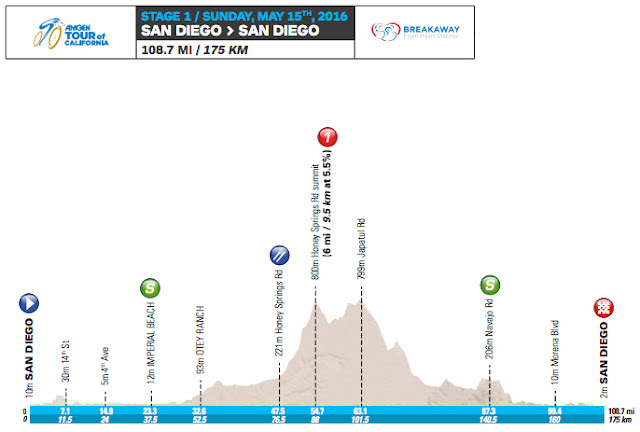 Stage 3 will be a breakaway climber's finish. 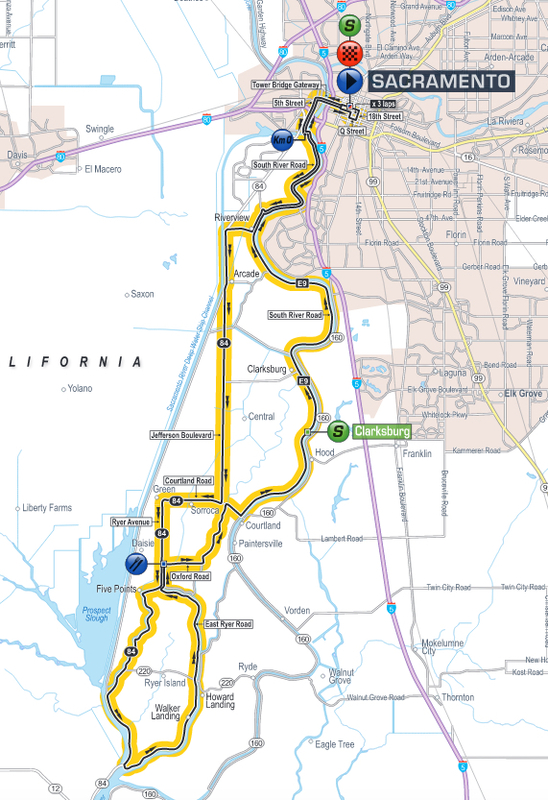 This stage is a new and exciting route in the history of the Tour of California. 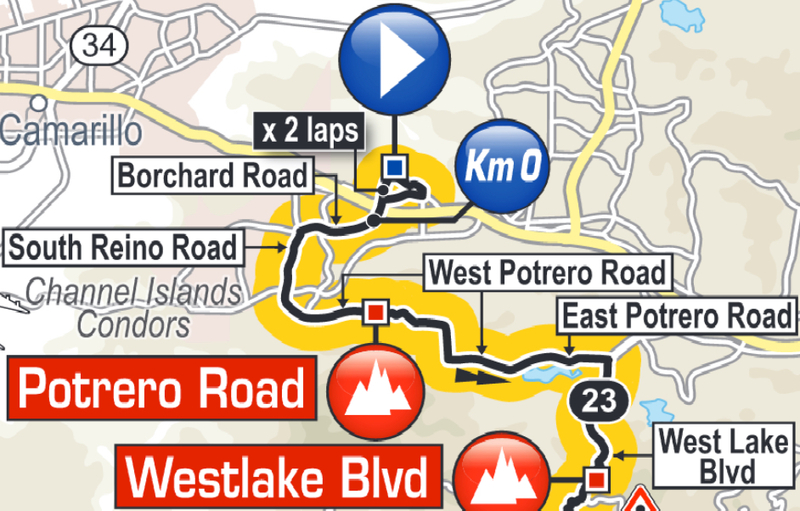 KOM locations: 1) Potroro Road, 2) Westlake Blvd, 3) Casitas Pass Road, 4) Gibraltar Road Finish (8% average grade)! Stage 4 - Morro Bay to Monterey County, May 18, 2016 Racing on Highway 1 south to north, the riveting and technical race day conclusion will be at a venue known for speed - the Laguna Seca Recreation Area, host to auto and motorcycle racing. 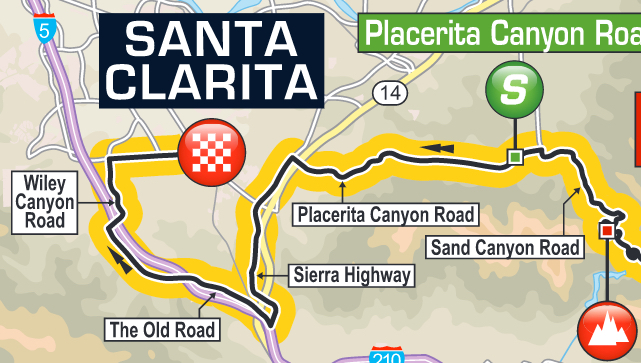 This will be the first time the peloton of the Tour of California will ride up Highway 1 in a south to north direction. Monterey is one of the most visited locations in California. 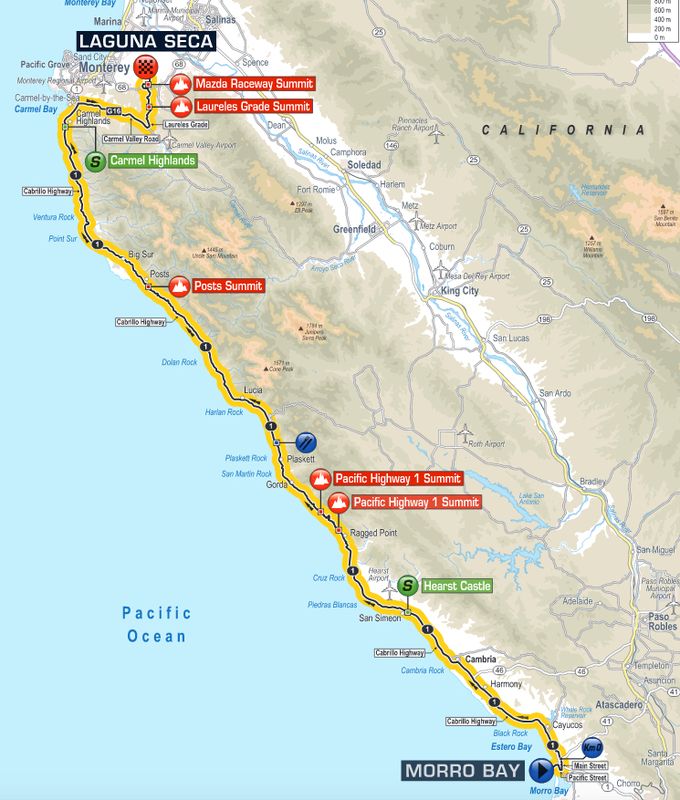 Depart: riders will depart from the base of Morro Rock, precede along the Embarcadero, turn left on Pacific Street through downtown and make a left on Main Street, up to Yerba Buena to join Highway 1. The peloton will race along the majestic Highway 1 along the California coast. From Morro Rock to San Simeon, past Hearst Castle, through Big Sur, over the famed Bixby Bridge, past Carmel-by-the Sea, and ending in Monterey County at Laguna Seca. 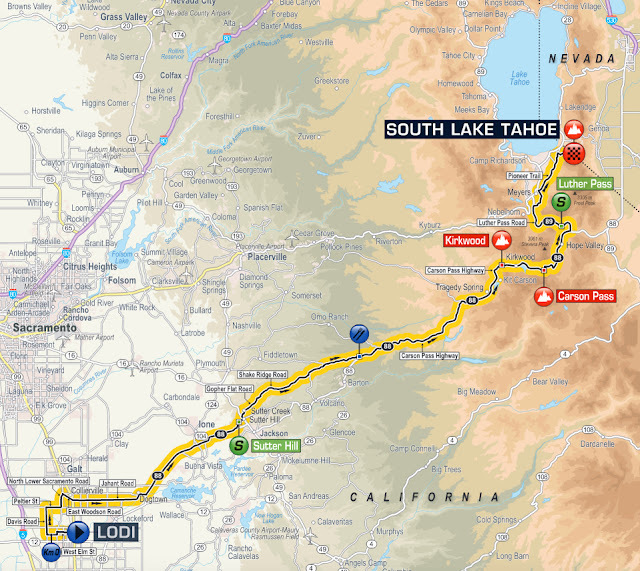 Stage 5 - Lodi to South Lake Tahoe, May 19, 2016 From here out, the four-day women's race will run in conjunction with the men's, including the same start and finish cities except for this day, when the women begin and end in South Lake Tahoe. 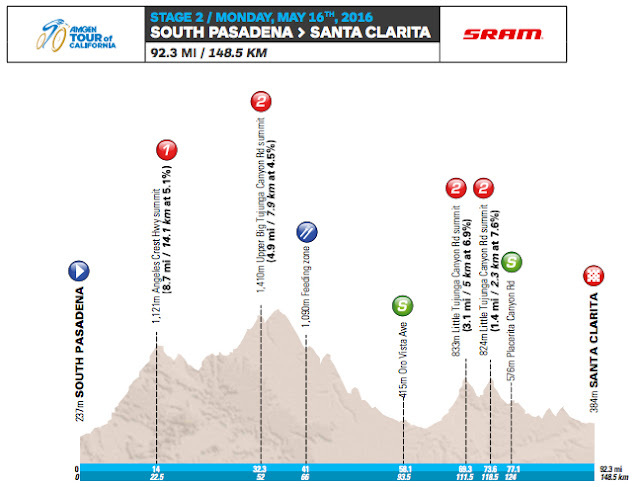 Featuring a long day of climbing, the stage will reach the highest elevation ever mounted by the race: 8,600 feet. In 1960 this area hosted the winter Olympics at Squaw Valley. Microsoft Tour Tracker goes live at 2:00 p.m. for the men's race. Men's and women's recap show at 9:00 p.m.
Strider will hold on-course races for kids in South Lake Tahoe – 1:00 p.m. 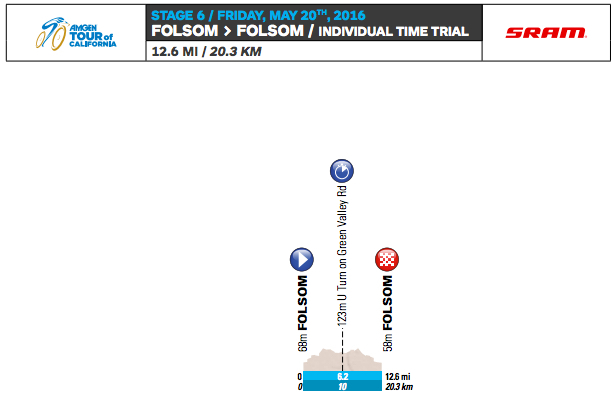 Stage 6 - Folsom Individual Time Trial & Women's Team Time Trial, May 20, 2016 The men's individual time trial returns to Folsom where Team Sky's Bradley Wiggins dominated en route to his 2014 overall Amgen Tour of California victory. The women will compete in a team time trial on the same course. Start ramp and Finish line are not in the same exact location. Start location of Sutter St., Finish line on Leidesdorff St.
Sprint & KOM: No KOM points awarded during an ITT, points awarded at the final sprint to the line. 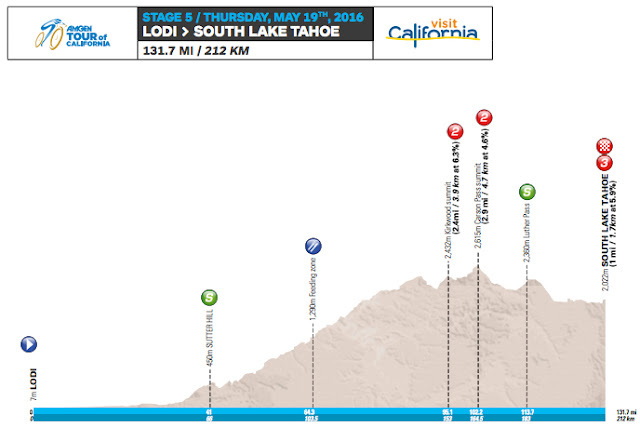 The polka-dot jersey after Stage 5 in Lake Tahoe will be worn at the start of Stage 7 in Santa Rosa. 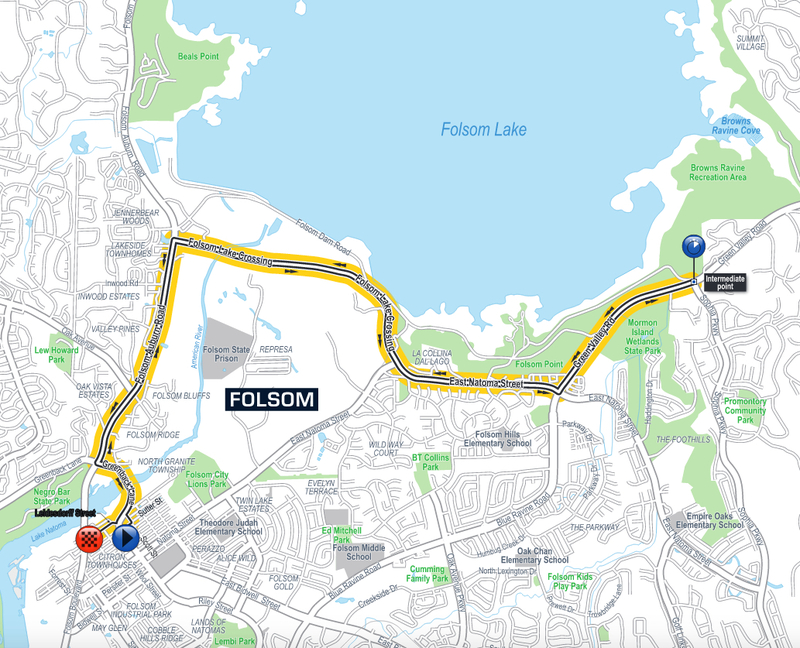 Folsom road closures and parking for Tour of California time trial 8:30 am - 4:30 pm. Bike Valets close - 4:30 p.m. The roads on the route will be fully closed with specific crossing points allowed and monitored by volunteer crossing guards. No public parking will be permitted in the Historic District on May 20 between 7:30 a.m. and 4:30 p.m. Spectators are encouraged to park and walk or ride a bike to the Historic District. Expected Outcome: Wide roads and non-technical, rolling course favors pure time trial specialists. Stage 7 - Santa Rosa, May 21, 2016 This year's stage will incorporate a portion of the uber popular Levi's GranFondo, with the men and women competing on different courses. 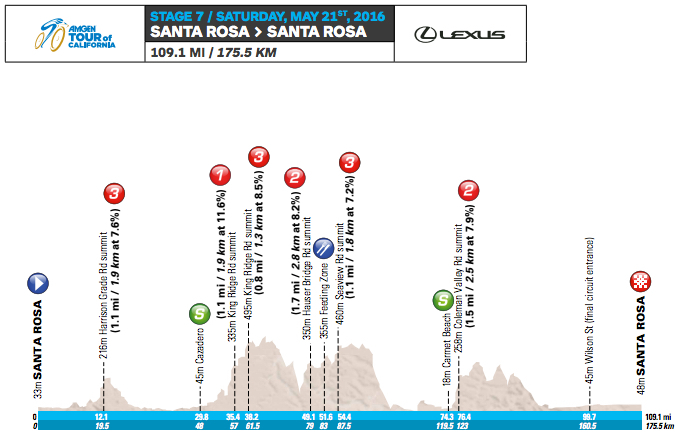 The scenic penultimate stage rolls along country roads through vineyards, redwoods, coastline and forests. "King stage" and "Penultimate Stage"
Microsoft Tour Tracker goes live at 1:30 p.m. for the men's race. Men's and women's recap show at 9:00 p.m.
Start and Finish is in the same location. 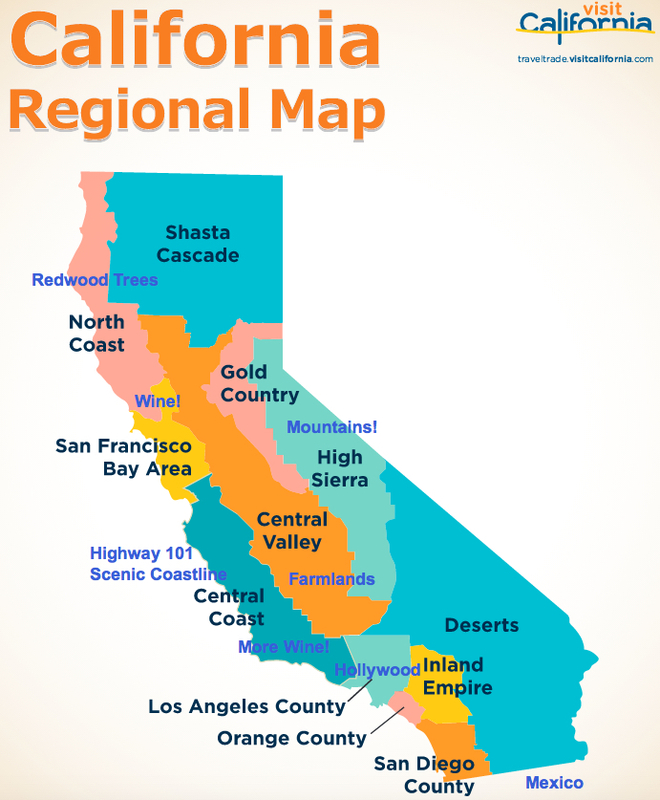 KOM 4 locations: 1) King Ridge Road, 2) and 3) Pacific Coast Highway, 4) Coleman Valley Road (only Coleman Valley is shown on the map below). 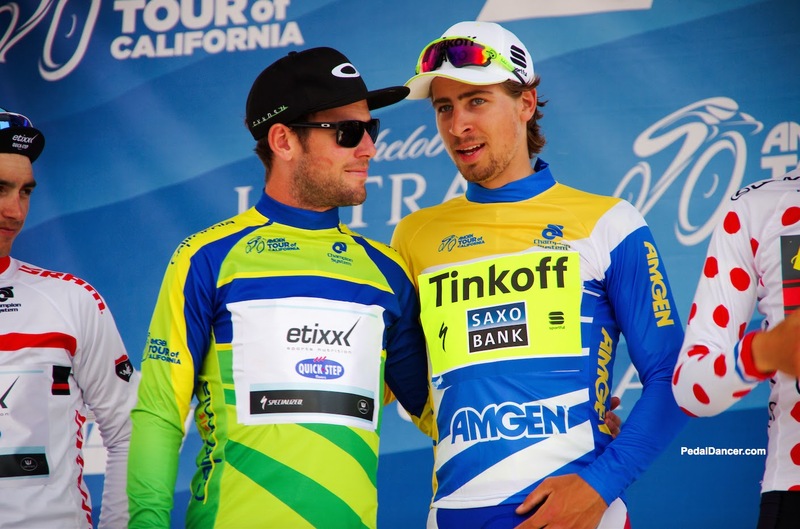 Today the winner of the KOM jersey will hold it for the overall King of the Mountain. Luther Burbank Rose Parade will take place while the peloton is out on course: 12:15-2:15 pm. Joan Lunden, breast cancer survivor, will be Grand Marshall of the parade in Santa Rosa, more information. 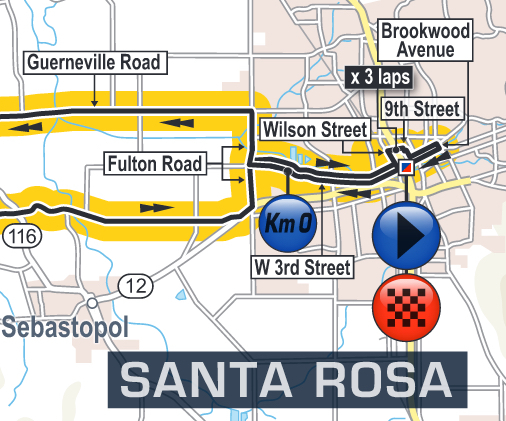 Breakaway Mile: Register for the Santa Rosa Breakaway Mile (prior to the men's race finish). 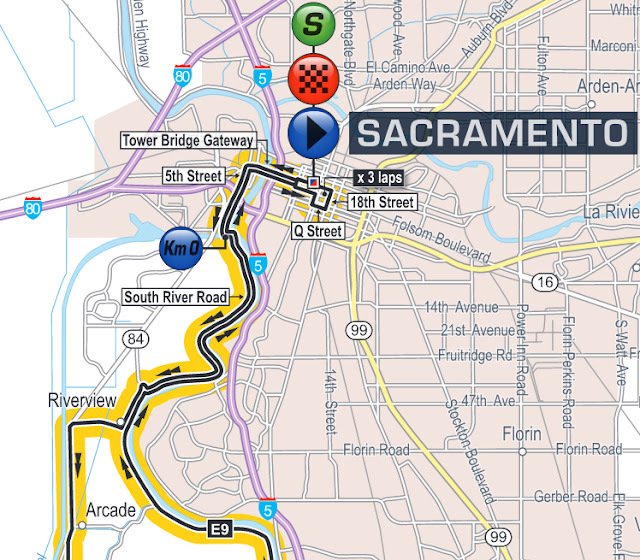 As an 8-time host, Sacramento will host the grand finale of both the men's and women's races for the first time. 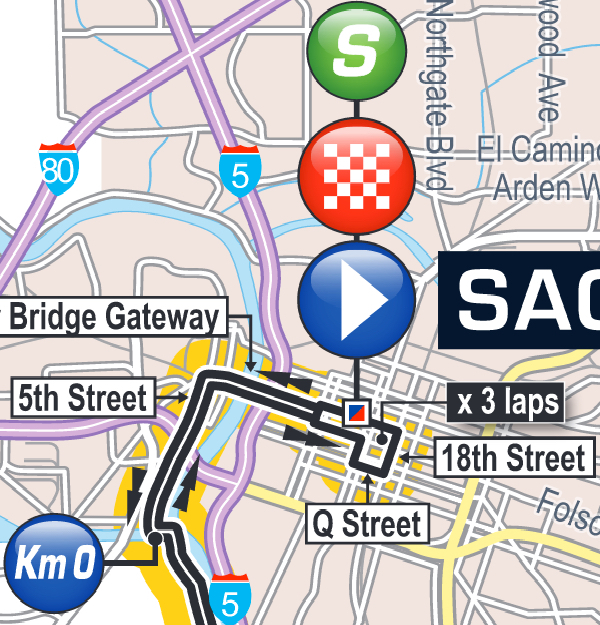 3 laps: the peloton will do 3 ceremonial laps of the downtown circuit before departing for the KM 0 marker where the real racing begins. KOM locations: No KOM points! Breakaway Mile: Register for the Saramento Breakaway Mile (prior to the men's race finish). Strider will hold on-course races for kids in Sacramento – 9:45 a.m.
For details on the WOMENS RACE route maps, teams, startlist and favorites and how to watch the race, please transfer to the Tour Chaser Womens Race TOC page. Laurens Ten Dam is featured in one of my all time favorite video clips on Alpe'd'Huez. Read the official Giant-Alpecin team medical update on 01/27/16 on five of Lauren's teammates undergoing surgery or medical care after being involved in a head on collision with a car during a training ride in Spain.